“We are very much scared,” says Musa Moses a resident of Adara community in Kaduna. He fears the return of the hoodlums, which massacred at least 73 members at Kasuwan Magani in Kaduna state. The same calamitous group attacked and abducted their royal father the Agom Adara, HRH Dr Maiwada Galadima (JP) and his wife the following day leaving dozens in the hospital with various degrees of injuries. They faced dozens of better armed attackers according to a statement sent to Per Second News Thursday night and signed by Awemi Dio Maisamari, president Adara development association. This is a further cause of anger and division, he said. ” In the evening of 18th October, 2018, another sectarian crisis was ignited at the Kasuwan Magani Thursday market in Kajuru Local Government of Kaduna State, he said. ” As usual, this immediately resulted in wanton violence and destruction. In the aftermath, many persons were killed and about 73 bodies were recovered and deposited in various hospitals in Kaduna. Other bodies are still being recovered in different locations and many persons are still missing. The number of persons injured, houses and shops burnt and properties destroyed are yet to be ascertained. ” As our community was still recovering from this barbarity routinely inflicted on it, the Agom Adara, HRH Dr Maiwada Galadima (JP) and his wife were attacked and abducted the following day Friday. In the process, some members of his entourage and other travellers were shot and killed or wounded. We thank God that his wife was abandoned the following day and eventually rescued. The coming of such horrendous incidents in quick succession once again shattered the increasingly fragile and elusive peace which our community was being denied by those who revel in sadistic pleasure. ” It is therefore with much anguish that we wish to express the consternation of our bemused community. We are however not surprised at the turn of events because the hand writing has been their on the wall. 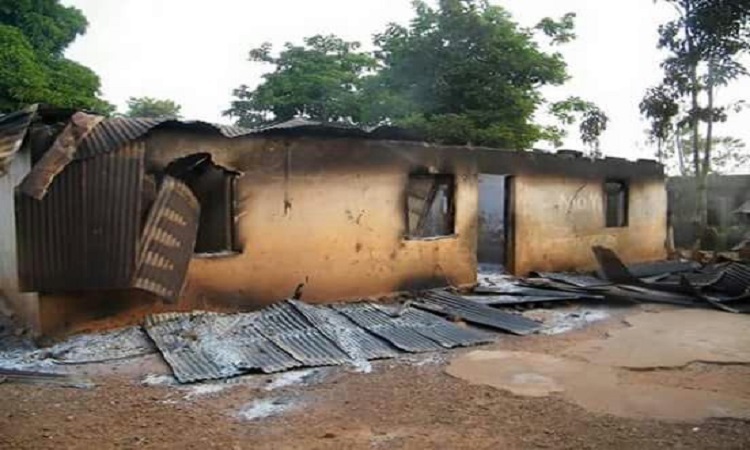 ” Unsatisfied with the carnage and destruction inflicted on us in the immediate past round of violence, some members of the Hausa community of Kasuwan Magani have not hidden their desire for more violence. We suspect that even the abduction of HRH Agom Adara is part of the ever increasing acts of denigration and injustice intended to stop any resistance and our feeble attempts at self defense against repeated and unjustified aggression. This seems to be the only logical reason why a minor misunderstanding involving two individuals in the market will result in such a bloody and destructive sectarian clash. It is now obvious that this is the massacre which some Hausas in Kasuwan Magani have been threatening so as to intimidate, terrorize and subdue non Hausa residents of the town to bring about their long anticipated Hausa Muslim superiority. In view of the above, we wish to make following observations to expose the complicity and duplicity of some elements in the Hausa community, security agents and the government in facilitating and condoning these crimes against humanity. 1. We raised an alarm over the sophisticated weapons and excessive fire power used by Hausa youth against our people during the February crisis. The alarm was ignored and those weapons were once again unleashed on our defenseless villagers. Honest security agents who restored peace during this crisis can testify to this. 2. After the last incident of this nature, our community demanded severally that serious dialogue be held with all interest groups to avert further crisis. We now have every reason to believe that the demand was deliberately ignored by authorities concerned to allow for more violence. 3. On the arrival of security agents at the scene of these crises, they usually embark on their standard practice of one sided attacks, brutalization and shooting of our people even in their homes. On the other hand, they rescue, protect, assist and sympathize with the other party to the crisis. This implies that our people are officially and unjustly always regarded as criminals deserving no mercy. 4. Security agents also habitually turn a blind eye to the open provocation, threats, display of dangerous weapons and even attacks by criminal elements of the Hausa community. On the other hand, they go out of their way to hunt for our people based on mere allegations leveled against them by the other party. 5. Security operatives also always go beyond crisis spots to chase, attack, shoot and even kill our people at the slightest opportunity. This is done even when such persons do not pose any serious threat to law and order, lives or property. That is how seven persons were shot (one fatally) in Maraban Kajuru on Friday, a day after the Kasuwan Magani killings. 6. In addition to the above biased trends, arrests were one sided. So far, more than 20 of our people have been arrested as against two or three Hausa people. 7. We wish to also frown at a situation where government always shows less or no concern when our people are victims. But the response is totally different when it is the other party. It has even reached a level whereby non Hausa indigenes of Kajuru Local Government are being openly labeled as terrorists and then discriminated against during employment because they dared to defend themselves. 8. On the abduction of HRH Agom Adara, we are amazed at the metamorphosis of the Kaduna State Government. From a power drunk, high handed and strong willed authority when dealing with legitimate disagreements or opposition, it shamelessly displays embarrassing impotence when confronted by real problems. If the whole apparatus of state power serving as the custodian of our common wealth cannot even protect one if it’s own, then where lies the fate of ordinary citizens? 9. We therefore wish to convey our complete disappointment, anger and humiliation at the disecretion of the highest symbol of the Adara nation. This atrocity leads to the logical fear that the community as a whole is liable to such a fate or even worse. a) Carrying out the urgent and total disarmament of the Hausa youth of Kasuwan Magani. In addition, ensuring adequate, fair and impartial security arrangements to restore peace and protect lives and properties in the area in particular and Adara Chiefdom as a whole. b) Taking all necessary and appropriate measures to protect the health, life and honour of HRH Agom Adara and ensure his immediate and unconditional release soonest. Government must act fast because any harm done to him may become a long term potential source of crisis. c). Empowering the Kajuru Local Government Council and indeed other Local Government Councils with similar security challenges to genuinely address the immediate and remote causes of all perennial community problems in partnership with their community associations. This is because peace cannot be imposed from outside but nurtured from within. In Kajuru Local Government, the lasting solution must include the relocation of the Kasuwan Magani market to a more suitable location in the local government. d). It has since become obvious to the world at large that the Nigerian government at all levels lacks the conscience, political will and the manpower to effectively address security challenges. It is therefore hightime for government to practically make security everybody’s business by fully mobilizing and engaging local communities and neighborhoods in their security. e). We are further demanding that government be honest and brave enough to identify, arrest and prosecute the real merchants of violence, death and destruction in our community and Nigeria in general. Usually, government hurriedly arrests and prosecutes scapegoats among the victims. But the real culprits are the most recurring parties in almost all violent clashes in Nigeria. Violent crises are increasing in frequency and intensity because the merchants enjoy government sympathy, protection and even patronage. 10. Finally, we are appealing to Adara community in particular and the public in general to remain calm and law abiding. Even in this season of provocation, blood, tears, sorrow and gloom, we must not yield to the temptation to conform to the new culture of violence being relentlessly imposed on our motherland. Just as nobody can be more Catholic than the Pope, we can never ever be more barbaric than the merchants of violence, death and destruction. We must be content to defend ourselves without attacking others. But most importantly, we must be uncompromising in our struggle for leaders, a government and a system that is truly for nobody but practically seen to be for everybody.